Equipped with 5% less CUDA cores than the GTX 1080 and the same GDDR5 memory as the vanilla GTX 1070, it’s not so simple to judge the performance of Nvidia’s new GTX 1070 Ti. With that information we can guess that in less memory demanding scenarios, it will be close to the GTX 1080 while it will be closer to the 1070 when memory throughput is more critical, although we’re curious to see how overclocking affects its standing. Something else worth noting here is that Nvidia has tied the hands of their board partners somewhat, at least for now. Whereas companies like MSI can produce factory overclocked GTX 1070 and GTX 1080 models, they aren’t allowed to do this with the GTX 1070 Ti. Instead, it’s up to you to extract that extra performance. We’re hoping to see big gains when overclocking the GTX 1070 Ti although I suspect out of the box the MSI GTX 1070 Ti Gaming won’t look particularly impressive when compared to the Gaming X variants of the 1070 and 1080. Without wasting any time... let’s see how the new MSI GTX 1070 Ti Gaming does compared to the 1070 and 1080 Gaming X models as well as AMD’s Radeon RX Vega lineup. Our Battlefield 1 results should show us just how well the MSI GTX 1070 Ti Gaming does out of the box. At 1440p, using the ultra quality preset it was good for an average of 93fps, which meant it was 12% faster than the GTX 1070 and 11% slower than the GTX 1080, pretty well smack bang in the middle and as luck would have it that places it alongside the air-cooled RX Vega graphics cards — doubt that’s a coincidence. Before getting into the overclocking, I have some Deus Ex: Mankind Divided results and here the 1070 Ti was just 6% faster than the Gaming X 1070. It was also 12% slower than the GTX 1080 so we might find memory overclocking will make a big difference here. AMD does well in this title and therefore the GTX 1070 Ti isn’t quite able to catch the Vega 56 graphics card. Moving on, we have the stock power figures and here we can see that MSI GTX 1070 Ti Gaming consumes the same amount of power as the GTX 1080 Gaming X, which is really only slightly more than the GTX 1070 Gaming X. So there’s certainly nothing unexpected about these results and it means the 1070 Ti reduced system consumption by 8% compared to the Vega 56. The GTX 1070 Ti is fairly impressive out of the box but it’s not going to wow many enthusiasts. It sits between the 1070 and 1080 in terms of performance which is fine and all but it also sits between them in terms of price and we’re not sure if there was any real need to fill that $100 price gap. Since you can buy a factory overclocked 1070 Ti I’m curious to see what’s possible here so I fired up MSI Afterburner and started the process of working out how far the core and memory could go. In the end I landed on what I feel is a pretty mild overclock. The base core clock was happy at 1767MHz while the memory went to 2252MHz for a 10% bump in core speed and 12% for the memory. This resulted in a Turbo Boost 3.0 operating frequency of at least 2GHz in games which is about a 9% jump from the stock boost frequency. I was hoping to reach at least 2050 MHz and I’m sure we’ll see other reviewers achieving that or better, perhaps I was just a bit unlucky with my card. Anyway, what kind of gains does this overclock net us? Let’s move on to find out. Once again we have Battlefield 1 up first and here we see an impressive 13% jump in performance, hitting 105fps and that is enough to match the GTX 1080 Gaming X. Although we only managed around a 10% frequency boost this extra gain has come from the increase in memory bandwidth. The good news here is you can achieve GTX 1080-like performance through overclocking, factory overclocked 1080 performance in fact. For those wondering, a custom overclock on the standard 1070 Gaming X card still sees it fall just short of the 1070 Ti’s stock figures. We saw a 15% gain in Mass Effect Andromeda and that’s a little higher than I was expecting. Raising the power limit and overclocking the memory has had a big impact here and now the 1070 Ti Gaming edges ahead of the GTX 1080 Gaming X for what is a very impressive result in this title. Then finally we see a 13% increase when testing with Deus Ex Mankind Divided and this was enough for the overclocked 1070 Ti to match the overclocked Vega 56 graphics card (in an AMD sponsored title nonetheless). Again, the overclocked 1070 Ti also mimics the performance of the GTX 1080 Gaming X. As surprising as the frame rate results were I have to say the power consumption figures are just as surprising. 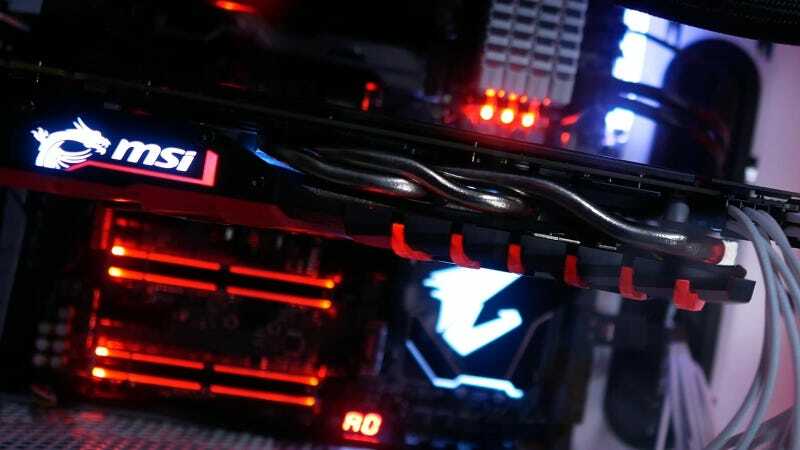 Despite increasing voltage, the total system consumption for the 1070 Ti configuration increased by just 14% to 346 watts. That’s only 5% more power draw than the stock Vega 56 graphics card and 22% less once Vega’s overclocked. Leaving the fan profile on auto, the MSI 1070 Ti Gaming still ran quiet and yet its temperatures maxed out at just 69 degrees after an hour long stress test. That said, for the most part it sat at 68 degrees. Anything south of 70 degrees is cool in my book, especially when the card is running almost silently.